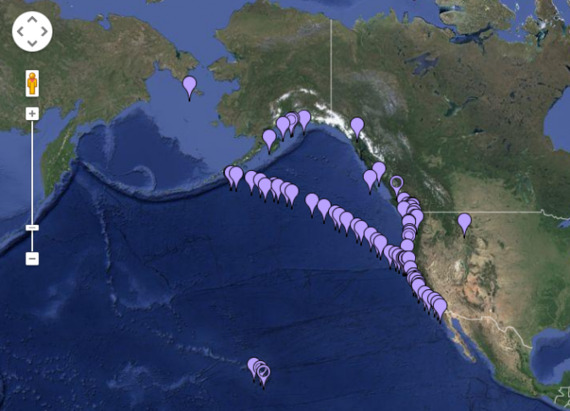 Image: The spots monitored for Fukushima radiation by the Woods Hole Oceanographic Institution. The West Coast of the United States seems under siege by negative environmental news: earthquake predictions, oil spills, drought, critically diminished water supply, wildfires, and numerous accounts of unusual coastal events: algae blooms, whale strandings, cancer in seals, collapse of fish stocks, and more. How to explain? Well, much of this can be attributed to climate factors where rising temperatures have resulted in multiple inter-related consequences: limited glacial melt, increased evaporation, no water, dry land, and the inevitable fire darkening that pristine Pacific air with smoke and ash the length of the coast. The ocean phenomena may be different. The warming of the ocean surely has an impact on changing growth patterns of marine plants and animals, just as the changing pH or acidity of the ocean has been shown to modify habitat and migrations. But what else? One argument has been the effect of radiation leaking from the three nuclear power plant reactors shut down by the earthquake and resultant tsunami tidal wave that inundated Fukushima, Japan in 2011, and has been thereafter distributed by ocean currents; indeed there is evidence of a plume of increased concentration of Cesium-134, and other radioactive elements that have been observed at unprecedented levels, spreading out some 5,000 miles into the Pacific toward North and South America. In April of this year, there were headlines declaring that "Fukushima radiation has reached the North American Shore" and concerns were raised, spread through the Internet and press, that this was surely the cause of these otherwise inexplicable anomalous natural events. There is no Federal agency that funds monitoring of radiation in coastal water, and the present effort, conducted since 2004 by Ken Buesseler, a marine chemist at the Woods Hole Oceanographic Institution, has been underwritten by crowd-funding and the efforts of volunteers taking samples to provide data on cesium isotopes along the west coast of Alaska, the U.S. mainland coast, and Hawaii, the information that has been used to model potential distribution and concentration of any contamination. A comparable effort has been launched in Canada, led by Jay Cullen of the University of Victoria in collaboration with government, academic, and NGO partners. The radioactivity has been decreased by time, the natural half-life of the isotopes, and by dilution in a very large and deep body of water. In their samples, Buesseler and his "citizen scientists" did detect cesium-137 already in the waters as a result of atmospheric nuclear weapons testing in the 1950s and 60s, and cesium-134 which does not otherwise occur naturally in the ocean and can only be attributed to Fukushima, to serve as a first baseline for subsequent collection, analysis, modeling, and conclusion. Buesseler channels his research through the Center for Marine and Environmental Radioactivity at the Woods Hole Institute, where he offers a preliminary conclusion that "the amount of cesium-134 reported in these new offshore data is less that 2 Becquerels (a radioactive measure) per cubic meter (the number of decay events per second per 260 gallons of water.) This Fukushima-derived cesium is far below where one might expect any measurable risk to human health or marine life, according to international health agencies. And it is more than 1,000 times lower than acceptable limits in drinking water set by the U.S. Environmental Protection Agency." Buesseler continues, "We emphasize that cesium-134 has not been detected YET as it has been detected offshore of North America by Canadian oceanographers... The uncertainty in the predictions by these ocean models only emphasizes the importance of collecting samples from along the shores. Remember too that those models predict interacting levels of both cesium isotopes for the next 2 or 3 years, the highest published prediction is for 20 to 30 Becquerels per cubic meter, or well below what is thought to be of human health and fisheries concerns." So, yes, and no. No definitive conclusion, no clear argument that radiation is the cause of those coastal events which distress us so. There is no solace in uncertainty, just as there is no certainty without evidence. The question is immensely important and thanks to Ken Buesseler and all those volunteers alongshore and in research vessels who are working to provide the substance for a real answer.